Objective: We assessed the ability of two commercially-available fractions labeled SX and D derived from the edible maitake mushroom to overcome many age-associated metabolic perturbations such as progressive, age-related elevation of blood pressure, over activity of the renin-angiotensin system (RAS), decreased insulin sensitivity, and inflammation in an in vivo laboratory model. Design and Method: We divided forty mature, female Sprague-Dawley rats (SD) into five groups of eight. SD ingested regular rat chow containing added sucrose (20% w/w). The groups received baseline diet alone (control) or baseline diet containing captopril, niacin-bound chromium, maitake fraction SX, or maitake fraction D. In addition to blood pressure readings, the following procedures were implemented: losartan and insulin challenges, evaluation of serum ACE activity, glucose tolerance testing, blood chemistries, LNAME challenge, and measurement of various circulating cytokines. Results: We found that implementation of all test conditions stopped the gradual elevation of systolic blood pressure (SBP) in the SD over the four months of study, even reversing some of the previous elevation that occurred over time. In general, the treatment groups showed decreased activity of the RAS estimated by less lowering of SBP after losartan challenge and decreased serum ACE activity and were more sensitive to exogenous insulin challenge. TNFa levels decreased in all four test groups suggesting a lessening of the inflammatory state. Conclusions: We believe our data suggest that maitake mushroom fractions lessen age-related hypertension, at least in part, via effects on the RAS; enhance insulin sensitivity; and reduce some aspects of inflammation -- actions that should lead to a longer, healthier life span. It is generally believed that diet influences many deleterious, age-related, chronic changes in human health [1-3]. To give well-studied examples of these phenomena, ingestion of large quantities of refined carbohydrates (CHO) like sucrose and fructose by certain strains of rats have been linked to systolic blood pressure (SBP) elevations [4,5], insulin resistance , and many inflammatory perturbations . Accordingly, safe, easy-to-implement, and effective dietary means to prevent, lessen or even overcome harmful, chronic health disorders via inhibition of these age-related metabolic disturbances would be welcomed. The present study examines in a rodent model the potential for two commercially available fractions labeled SX and D derived from the edible maitake mushroom to overcome many age-associated metabolic perturbations such as the progressive elevation of blood pressure (BP) and disordered glucose metabolism. Previous studies have found that whole powder and crude fractions of the mushroom might do so [8-13]. As a secondary gain, the influences of SX and D on the renin-angiotensin system (RAS), insulin sensitivity, and inflammation were also examined. The Animal Welfare Board at Georgetown University Medical Center approved the protocol for this investigation. Forty mature female Sprague-Dawley rats (SD), obtained from Taconic Farms, Germantown, NY, were used. The present studies were carried out on SD near one year in age (338 days). The SD, weighing between 280-378 g at the beginning of the studies, were housed in a constant temperature room with a light-dark phase of 12 hours each. The SD rats were divided into five groups, each containing eight rats. All rats ate a basic diet of ground regular rat chow containing sucrose (20% w/w). The control group received only the basic diet, while the other four groups each received the basic diet containing on a weight basis: captopril, (30 mg/Kg) niacin-bound chromium [NBC] (8.6 mg/Kg), Maitake Fraction D (350 mg/Kg) or Maitake Fraction SX (3500 mg/Kg). Based on weight and metabolic considerations for the rat , the doses of NBC, fractions D and SX roughly approximate effective human doses as suggested by the supplier for these natural ingredients. Maitake D Fraction is a standardized extract from maitake mushroom that contains as it active ingredient a protein-bound beta-glucan that is a powerful enhancer of the immune system through oral administration . The water-soluble fraction of powdered whole Maitake mushroom designated SX-fraction is a glycoprotein with an average molecular weight of 20,000 Daltons that is extracted from maitake mushroom through a proprietary process developed by Maitake Products, Inc.1 . Both mushroom extracts were the generous gift of Mushroom Wisdom, Inc. (East Rutherford, NJ). The SHR were followed for 120 days while consuming their respective diets. Body weights and systolic blood pressure (SBP) were routinely measured. During the last two weeks of the study, specialized tests [glucose-tolerance (GTT), insulin-challenge (ICT), losartan challenge, and L-Name challenge] along with blood chemistry assessments were carried out. BW was estimated by routine scale measurements. Two reading taken at least 10 minutes apart on the given day had to be within two grams of each other or the procedure was repeated until the weights were consistently within the two gram range. Water and food intakes were estimated close to the mid point of the study by subtracting the volume or weight of the remaining fluid and food from the amounts premeasured 24 hours earlier. Systolic blood pressure (SBP) was measured by tail plethysmography  using two different instruments. As in many of our previous studies and for the majority of our measurements, we used an instrument from Narco Biosciences (Houston, TX) [4,5]. This allowed us to rapidly measure SBP with a beeper sound system. The second reading was performed on an instrument obtained from Kent Scientific Corporation (Torrington, CT). This is a computerized, non-invasive tail cuff acquisition system that utilizes a specially designed differential pressure transducer to non-invasively measure the blood volume in the tail. The latter instrument not only allowed us to record SBP, but also diastolic BP (DBP), mean BP (MBP), and cardiac rate. A previous report showed that the SBP readings were essentially similar between the two instruments . Rats were allowed free access to their diet and water until SBP and the other cardiovascular readings were obtained after a slight warming between 13.00 h and 17.00 h. Multiple readings on individual rats at each reading were taken. To be accepted, SBP measurements on a given rat had to be virtually stable. Over the course of study, multiple readings were recorded. Blood for chemical analysis was obtained at the end of the chronic protocol following removal of food the night before. Chemistry data were obtained via dry chemistry procedures using a Johnson and Johnson Vitros 250 instrument. During the ipGTT, glucose (2.5 g/Kg BW) was injected intraperitoneally (i.p.) to challenge the tolerance to glucose. Drops of blood were obtained from the rat tail at 0, 15, 30, 60, and 120 minutes post injection. Glucose was estimated using commercial glucose strips (Lifescan, One Touch Ultra, Melitas, CA). Insulin measurements were made at baseline and one hour into the testing. Statistical comparisons were made by differences in area under the curve (AUC) over the two hours of study. Testing was commenced after 17-19 hours of food deprivation. For ICT, 0.6 unit of regular insulin/kg BW (Eli Lilly Co., Indianapolis, IN) and glucose 250 mg/Kg were administered intraperitoneally (i.p.). Blood for glucose determinations was obtained from the tail vein at 7.5 minutes after injection. Glucose was estimated using commercial glucose strips (Lifescan, One Touch Ultra, Melitas, CA). After performing baseline SBP readings, SHR from all dietary groups were given 20 mg/kg losartan orally via gastric lavage . Three and six hours after lavage, SBP was remeasured. The decreased SBP after losartan was used to estimate activity of the RAS with a greater decrease in SBP connoting augmented system activity . ACE refers to the angiotensin converting enzyme. 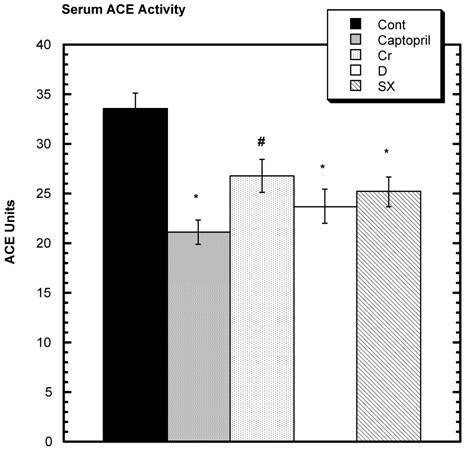 Serum ACE activity was measured by a commercial kit (Sigma Co. Ltd, St. Louis, MO) . This spectrophotometric method utilizes the synthetic tripeptide substrate N-[3-(2-furyl)acryloyl]--phenylalanylglcylglcine (FAPGG). FAPGG is hydrolyzed by ACE to furylacryloylphenylalanine (FAP) and glycylglycine. Hydrolysis of FAPGG results in a decreased absorbency at 340 nm. Serum ACE activity was determined by comparing the sample reaction rate to that obtained with an appropriate ACE calibrator. 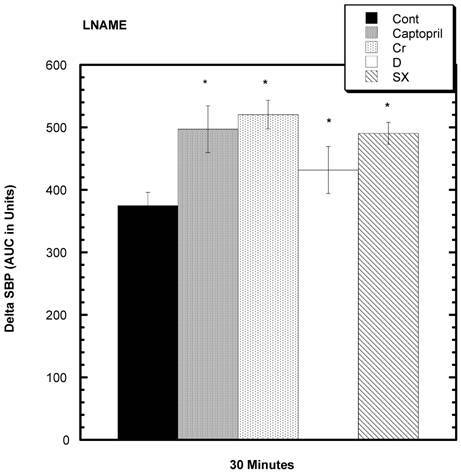 Effects of nitric oxide synthase (NOS) inhibition on SBP were measured . After baseline measurements of SBP, the NOS inhibitor Nw-nitro-L arginine-methyl ester hydrochloride (LNAME) was given intraperitoneally (i.p.) at a dose of 10 mg/kg. Each rat received a single dose of LNAME. Measurements of SBP were taken at four, seven, 10, 15, and 20 minutes post injection. The area under the curve was used to estimate activity of the NO system with an increase in SBP connoting augmented system activity. Various cytokines were measured by ELISA methodology using kits from the following sources: rat MCP-1 - Assay Designs Inc., Ann Arbor, MI; rat adiponectin - ALPCO Diagnostics, Salem, NH; TNF-a, ALPCO Diagnostics, Salem, NH; RAT IL-1B - Assay Designs Inc, Ann Arbor; Rat IL-6 - ALPCO Diagnostics, Salem, NH. Results are presented as mean ± SEM. SBP and BW were examined by repeated measures, 2-way analyses of variance (one factor being group and the second factor being time of examination). Where a significant effect of regimen was detected by ANOVA (p<0.05), the Dunnett t test was used to establish which differences between means reached statistical significance . When the data from two columns were analyzed at a single time point, Student's t test was used. Statistical significance was set at a p < 0.05. A trend is defined as p <0.1>0.05. There was a steady decrease in average body weight over the four months of study in these mature female SD (Fig. 1). Examining the overall data over the course of study shows that the changes in weight were reasonably similar in all groups during the study. The food and water intakes near the mid point of study are depicted in Table 1. There were no significant differences in the 24 food consumption, and water intake was similar in all groups with the exception of the SD taking captopril in their food. These rats had a lower average water intake. Tail blood was obtained at the end of study, and in general, the various blood chemistries among groups were similar. The only statistically significant differences were in the circulating creatinine levels. The values of the SD consuming fraction D or fraction SX were statistically significantly elevated and those of the SD ingesting niacin-bound chromium trended upward compared to control. Similar changes were not seen in BUN concentrations. Although the fasting blood sugar (FBS) levels averaged lower in the chromium and maitake groups, these values did not attain statistical significance. 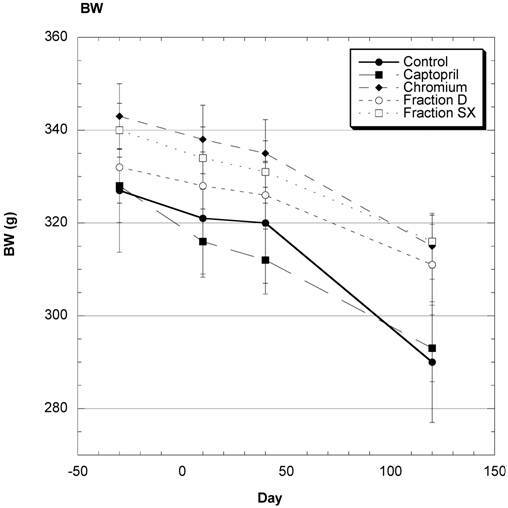 Body weight (BW) of SD in Control, Captopril, Chromium, Fraction D and Fraction SX groups over the course of study. Data are expressed as mean ± SEM. 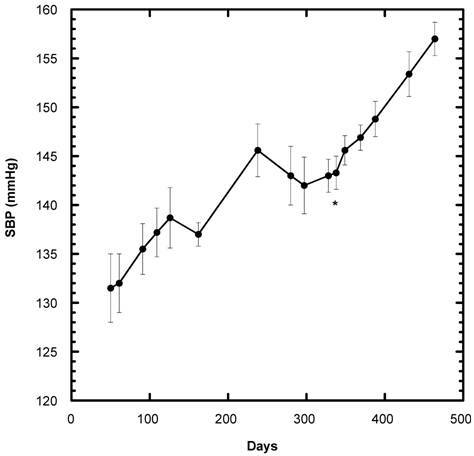 Although this study was initiated on day 338 in the life of the female SD, the SBP of all 40 SD ingesting the control diet containing 20% sucrose had been recorded previously -- starting on day 50 of life up to that point in time (Fig, 2). From day 338 on, only the SBP of the group that continued as Control 0(n=8) is depicted. Of note, throughout their recorded lifespan, the SBP of the female SD consuming only diet generally increased, i.e., the gradual rise followed for more than one year was about 25 mm Hg. The average SBP readings of the control group rose steadily over the four months of the present study - day 338 to day 464 (Fig. 2,3). In Fig. 3, Day 338 is listed as 0. In contrast, the average SBP of the groups receiving chromium, fraction D, or fraction SX decreased significantly after 10 days on their respective diets and remained at fairly consistent levels (Fig, 3). Those SD in the captopril group showed no significant decrease at 10 days but a significant lowering of average SBP by day 30 and throughout the remainder of the study. The entire BP profile and heart rate were assessed near the end of the study as shown in Table 3. Measured by another method, the SBP remained significantly lower in all test groups compared to control, with the lowest average readings in the captopril group. Likewise, the average diastolic (DBP) and mean BP (MBP) were significantly lower in the test groups compared to control. There were no significant differences in the cardiac rate among groups. The area under the curve (AUC) for the 2 hour-long ipGTT was lowest in the Maitake SX group, but not statistically significantly different. No significant differences among the five groups were seen in circulating insulin levels at baseline and 1h into the test. Systolic blood pressure (SBP) of SD rats under Control conditions over a period of 458 days (n=8). The present study began on Day 338 of their lifespan. The start of the present study is indicated by * below the initial baseline reading. Data are expressed as mean ± SEM. Systolic blood pressure (SBP) of SD in Control, Captopril, Chromium (Cr) and Fraction D (D) and Fraction SX (SX) groups over a period of 120 days. n=8 in each group. Data are expressed as mean ± SEM. Average ± SEM is shown for 6-7 SD. None of the values are significantly different from control. Both the control and treatment groups were challenged with intraperitoneal (i.p.) glucose and regular insulin. Seven and one-half minutes after the combined challenges with insulin and glucose, the levels of circulating glucose were as follows: control 173 mg/dl ± 7.5 (SEM); captopril 155 mg/dl ± 9.2 (SEM), niacin-bound chromium (NBC) 142 mg/dl ± 6.7 (SEM); Fraction D 133.3 mg/dl ± 7.2 (SEM); and Fraction SX 138.8 mg/dl ± 6.3 (SEM). Compared to control, these values were statistically significantly different in the niacin-bound chromium, Fraction D and Fraction SX groups. The values in the captopril group showed a trend. SD challenged with losartan showed a decrease in SBP (Fig. 5). Over the six hours of study, the average decrease from baseline in the control group was -42.0 mm Hg ± 2.5 (SEM) that was statistically greater than all the test groups: captopril group -19 mm Hg ± 1.9 (SEM), niacin-bound chromium -28.5 mm Hg ± 2.5 (SEM), fraction D -34.0 mm Hg ± 1.0 (SEM), and fraction SX -24 mm Hg ± 1.9 (SEM). Estimating ACE activity, it was found that the activity was statistically lower than control in the captopril, fraction D, and fraction SX groups and the lessened activity trended toward significance in niacin-bound chromium group (Fig.6). LNAME was injected into the SD to estimate NO activity . After 30 minutes, there was a statistically significant increased area under the curve (AUC) for all four test groups compared to control. TNF-a levels were statistically lower in all the test groups: captopril, niacin-bound chromium, Fraction D, and Fraction SX compared to control. IL-6 was not significantly lower in any of the test groups. IL-1b-a, MCP-1, and adiponectin concentrations were not significantly different in any test group compared to control. Ave ± SEM of 8 rats. Unit for Adiponectin is ng/ml. Elevation of circulating glucose level above baseline 7.5 minutes after i.p. injection of regular insulin and glucose. The elevations are significantly less in the Chromium (Cr) and Maitake D and SX groups signified by the symbol * compared to Control. A trend compared to Control is seen in the Captopril group (#). n=8 in each group. Data are expressed as mean ± SEM. Decrease in SBP from baseline over 6 hours after oral challenge with losartan. All test groups were statistically significantly different from control after 6 hours. n=8 in each group. Data are expressed as mean ± SEM. Circulating Angiotensin Converting Enzyme (ACE) Activity among various groups. A trend (#) for a lowering compared to Control was seen in the Chromium group (Cr). While the other three test groups were significantly lower than Control (*). n=8 in each group. Data are expressed as mean ± SEM. Response to L NAME challenge among various groups. Increase in SBP from baseline over 30 minutes after i.p. challenge with L NAME. All test groups were significantly different from control over 30 minutes. n=8 in each group. Data are expressed as mean ± SEM. Hypertension, an important preventable major risk factor for cardiovascular diseases and strokes that becomes more prevalent with aging, commonly occurs after age 30 years . Many believe that dietary macronutrients, especially refined CHO like sugars, play a significant role in age-related BP elevation [1,2,4]. Although Wotecke et al  estimate that total CHO consumption has fallen from 56% to 46% of energy intake over the first 75 years of the 21st century, this has been wholly at the expense of complex CHO, because the consumption of refined CHO, especially sucrose and fructose, rose steadily to exceed 20% of the energy intake. With the popularity of soft drink consumption, intake of sucrose and fructose has even become greater over the last few years . Could this dietary change be related to the prevalence of hypertension ? Sprague-Dawley rats (SD) are considered a normotensive strain of rats. Prior to beginning the present study, however, we fortuitously found that female SD consuming a regular diet containing added sucrose showed a gradual rise in the systolic blood pressure (SBP) from normotensive levels to hypertensive levels over a long term (>150 mm Hg). Use of the female gender is important because of lesser information on females who have a particularly difficult time with age-related hypertension [2,22]. Sucrose was added in the present investigation to assure that the regular feed of the SD contained a virtually similar portion of refined CHO calories as the normal American Diet  and may have been responsible for the hypertensive range of SBP in the SD [4-6]. Suffice it to say, this BP pattern in SD simulates in many ways the age-related hypertension often noted in humans . The pathological mechanism(s) behind the gradually rising, chronic BP elevation associated with refined CHO ingestion and/or aging is uncertain, because the elevated SBP may relate to a number of perturbed underlying regulating mechanisms that include augmented catecholamine levels , disturbed vasodilatory function via disturbances in NO signaling in blood vessels , alterations in fluid and electrolyte balance , and disturbances in the renin-angiotensin system (RAS) manifested by elevated circulating levels of angiotensin-2 . The association between the RAS and sugar-induced hypertension is especially intriguing, because, in addition to the elevated BP, recent findings show a direct, deleterious effect of circulating angiotensin-2 on the cardiovascular system . This may explain, at least in part, a previous finding that high consumption of sugars, shown to increase circulating levels of angiotensin 2 , can be associated with vascular lesions . The ability of captopril to lower the elevated BP produced by sugar ingestion also corroborates the important role of the RAS in sugar-induced hypertension. Niacin-bound chromium (NBC) has also been shown to lower the activity of the renin-angiotensin system and was, along with captopril, added as a positive control in these experiments . In the present study, both NBC and captopril decreased blood pressure and lessened the activity of the RAS. In previous investigations, whole maitake mushroom and crude fractions of the mushroom were shown to favorably affect hypertension and glucose-insulin metabolism in rodents [9-13]. The crude fractions included a water extract and an ether extract, and the two rat species examined were genetically hypertensive rats (spontaneously hypertensive rats [SHR]) and genetically insulin-resistant rats (Zucker Fatty Rats [ZFR]). Different results were found in each species. At 35 days, only consumption of the diet containing the ether fraction significantly decreased systolic blood pressure (SBP) in SHR (average 197 vs. 176 mm Hg, p <. 001), while in ZFR only the groups consuming the whole maitake and water extract showed significantly decreased SBP (138 vs. 120-125 mm Hg, p <. 001). Even though the RAS could have played a role in the BP effects of the mushroom and its extracts on the SHR, a losartan challenge test in ZFR suggested that angiotensin 2 did not play a major role in SBP regulation under the conditions examined. In the present investigation, female SD rats showed gradually, but steadily, increasing SBP as they aged. 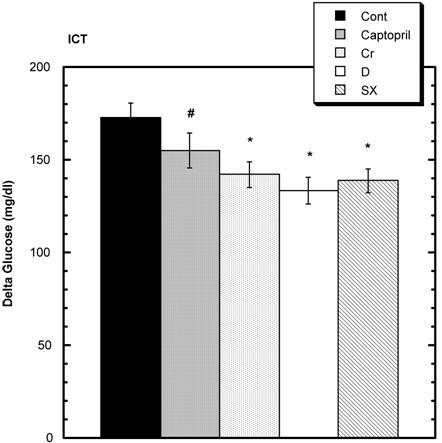 Similar to the groups consuming captopril or niacin-bound chromium, SBP decreased significantly early on indicating that both SX and D could halt and even reverse to some extent the sugar-induced/age-related elevations of SBP (Figs. 2,3). By the end of the four months after introduction of the maitake fractions into the diet, the diastolic and mean BP were also significantly reduced compared to control. 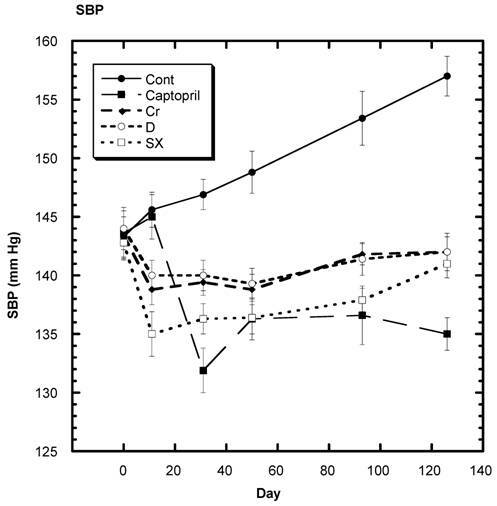 In the face of no significant differences in body weight and food and fluid intake suggesting that the test rats were receiving the tested substances in the proportions desired, the SBP changed markedly under all test conditions, with the captopril addition bringing the SBP virtually to the same SBP as months earlier - reversing all the age-related elevations. With a single exception, i.e., the rise in creatinine with the maitake fractions, blood chemistries revealed no significant toxic changes to go along with other evidence, i.e., no changes in appetite or body weight. We attribute the rise in creatinine levels in those SD consuming fractions SX and D to changes in muscle mass secondary to the status of insulin sensitivity and not to any problems with renal function, since the BUN levels were similar among groups. An insulin-sensitizing agent like niacin-bound chromium has previously been associated with enhanced muscle build up . Examining a panel of cytokines, all the test groups showed significantly lower levels of circulating Tumor Necrosis Factor-alpha (TNF-α) suggesting some anti-inflammatory capabilities (Table 5). Two tests to assess the activity of the RAS suggest that decreased activity occurred when Fraction SX and all test groups were compared to control. The greater decrease in SBP after losartan challenge in the control group suggests that the RAS was more active in the control group compared to the SX group (Fig.5) [19,33]. 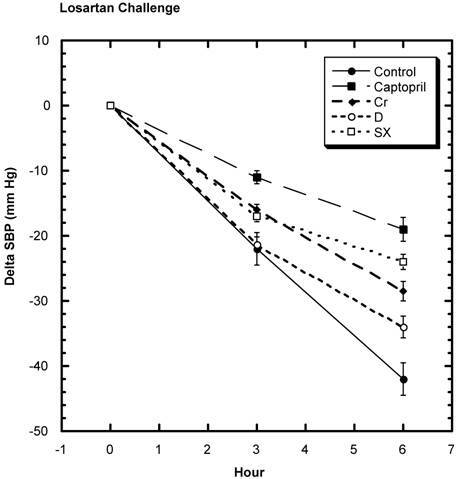 When estimating the ACE activity in the serum of the SD , the latter was found to be lower in the captopril, fraction D and Fraction SX group compared to control. The NBC group showed a trend toward decreased activity relative to control. Previous in vitro work pointed out the ACE inhibitory effects of mushrooms . Kopilas et al 27] examined sugar-induced BP elevations in SHR and concluded that the NO system was significantly involved in the pathogenesis. We examined the ability of LNAME, a substance that can inhibit the dilatory actions of NO, to influence SBP and found a trend toward raised BP, more so in all the test groups. Accordingly, this supports the contention that a relatively depressed NO system is involved in sugar-induced hypertension  and that captopril, chromium, and fractions D and SX can enhance this system causing lower SBP. Based upon previous findings, addition of Maitake SX to the diet of sucrose-eating rats would be expected to enhance insulin sensitivity, and we believe that to be the case here [11,13]. In the present study carried out on normotensive, female Sprague-Dawley rats, the circulating levels of fasting blood glucose (Table 2) and the area under the curve in a glucose tolerance test (Table 4), tended to be less, although not significantly so. More to the point, however, the challenge test to estimate insulin sensitivity did show a statistically improved activity in the SD ingesting fraction SX. Captopril and NBC were examined at the same time to act as positive controls. Ace inhibitor agents, like captopril, have been reported to have insulin-sensitizing abilities [36-39] and could theoretically reduce inflammation [40,41], and this proved to be the case here. Captopril showed a trend toward enhancing insulin sensitivity, and NBC, previously shown to enhance insulin sensitivity, also did likewise. Somewhat surprising was the finding that Fraction D enhanced insulin sensitivity. It is not clear why this happened. Fraction D is known primarily for its immune enhancing properties . It is unclear if the same substance or a difference substance in SX and D is responsible for the enhancement of insulin sensitivity and the inhibition of RAS. To summarize some major points emanating from the present study, two commercial extracts of maitake mushroom (SX and D) are safe natural products that can favorably influence the progressive elevation of SBP over time, enhance insulin sensitivity, and lower circulating levels of a cytokine associated with inflammation - TNF-α. Accordingly, this makes the maitake mushroom and its commercial extracts excellent candidates to produce a long, healthful life span . Supported by a grant from the Perricone Research and Education Foundation. Maitake Fractions SX and D were the generous gift of Mushroom Wisdom, Inc., E Rutherford, NJ. Niacin-bound chromium was a generous gift of InterHealth USA of Benicia, CA.